Discover one the Middle East’s superyacht hotspots on board 72 metre Serenity. Following an extensive refit last year, the yacht has been granted the first permit to charter in the UAE. The new permit means that she will be able to stay in the region for more than the usual 21 days, allowing ample time for charter guests to explore the region. Custom built in 2004 by Austal, Serenity can accommodate up to 30 guests in 15 cabins, which makes her ideal for event charters such as the Abu Dhabi Grand Prix. Other stand out features include a spacious sundeck with a large Jacuzzi surrounded by sun pads, multiple al fresco areas for both formal and casual dining, a gym and a cinema room. She also boasts a great selection of water toys including paddle boards, jet skis and a fly board. An increasing number of superyacht have been spotted in the Gulf region over the past few years. The UAE offers a host of onshore activities for charter guests to enjoy including shopping malls, beach clubs and some of the world’s best spas. In Abu Dhabi, the Louvre that opened last November is a further draw for visitors. Serenity is available for charter with SSH Maritime from €450,000 per week. Discover one the Middle East’s superyacht hotspots on board 72 metre Serenity. Following an extensive refit last year, the yacht has been granted the first permit to charter in the UAE. The new permit means that she will be able to stay in the region for more than the usual 21 days, allowing ample time for charter guests to explore the region. Custom built in 2004 by Austal, Serenity can accommodate up to 30 guests in 15 cabins, which makes her ideal for event charters such as the Abu Dhabi Grand Prix. Other stand out features include a spacious sundeck with a large Jacuzzi surrounded by sun pads, multiple al fresco areas for both formal and casual dining, a gym and a cinema room. She also boasts a great selection of water toys including paddle boards, jet skis and a fly board. An increasing number of superyacht have been spotted in the Gulf region over the past few years. The UAE offers a host of onshore activities for charter guests to enjoy including shopping malls, beach clubs and some of the world’s best spas. In Abu Dhabi, the Louvre that opened last November is a further draw for visitors. Serenity is available for charter with SSH Maritime from €450,000 per week. Dive in to Mexico’s Sea of Cortez and explore “the world’s aquarium” on board 30 metre Sunseeker Emrys. Her highlights include an impressive sun deck equipped with a three-stool bar, al fresco dining area, and a retractable sunroof allowing guests to use the space in rain or shine. For lazy afternoons she also boasts two enormous sun pads, one on the aft sundeck and one on the foredeck. The cosy interior features warm walnut floors accented by cream leather sofas, with an open plan saloon and formal dining area boasting large windows and plenty of natural light. Emrys has accommodation for up to eight guests in four en suite cabins, including a split-level master suite with it's own lounge, a full beam VIP cabin, and two twins. Guests are catered for by an experienced crew of four. Mexico is dotted with large protected bays which make for idyllic anchorages, with dozens on trails on land and golden beaches. But it's real appeal is the abundance of marine life including whale sharks, sea lions, dolphins and more. Cruising Mexico and California all year round, Emrys is managed for charter by Ocean Independence with a weekly charter rate of $50,000. Dive in to Mexico’s Sea of Cortez and explore “the world’s aquarium” on board 30 metre Sunseeker Emrys. Her highlights include an impressive sun deck equipped with a three-stool bar, al fresco dining area, and a retractable sunroof allowing guests to use the space in rain or shine. For lazy afternoons she also boasts two enormous sun pads, one on the aft sundeck and one on the foredeck. The cosy interior features warm walnut floors accented by cream leather sofas, with an open plan saloon and formal dining area boasting large windows and plenty of natural light. Emrys has accommodation for up to eight guests in four en suite cabins, including a split-level master suite with it's own lounge, a full beam VIP cabin, and two twins. Guests are catered for by an experienced crew of four. Mexico is dotted with large protected bays which make for idyllic anchorages, with dozens on trails on land and golden beaches. But it's real appeal is the abundance of marine life including whale sharks, sea lions, dolphins and more. Cruising Mexico and California all year round, Emrys is managed for charter by Ocean Independence with a weekly charter rate of $50,000. As of January 2019, the 67.5 metre Icon will be available for charter in the unspoilt territory of the Seychelles. Delivered in 2010 and refitted in 2014, she can sleep 12 guests in her six spacious ensuite cabins. Her standout master suite boasts an additional saloon and office space for ultimate privacy and respite. She has a crew of 17 to ensure the comfort of all guests onboard. The living and dining spaces on board Icon are modern and elegantly designed in a monochrome scheme. Her highlights include the beach club’s new gym (equipped with a cross trainer and other multi-purpose machinery), a Jacuzzi, a steam room and sauna. These amnesties are surpassed only by the extensive aft deck pool, from which guests can enjoy unobstructed views of the aquamarine waters and stunning islands. With its plentiful marine life and tranquil, secluded bays, the Seychelles makes for the perfect superyacht retreat away from the crowds – ideal for fishing, water sports or just some peace and quiet. The generously sized Icon provides the ultimate comfort and luxury for those wishing to discover the remote and exotic beauty of the Seychelles. 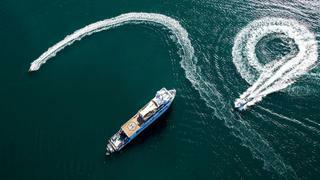 Icon is managed for charter by Bluewater. Her weekly charter rate starts at €550,000. As of January 2019, the 67.5 metre Icon will be available for charter in the unspoilt territory of the Seychelles. Delivered in 2010 and refitted in 2014, she can sleep 12 guests in her six spacious ensuite cabins. Her standout master suite boasts an additional saloon and office space for ultimate privacy and respite. She has a crew of 17 to ensure the comfort of all guests onboard. The living and dining spaces on board Icon are modern and elegantly designed in a monochrome scheme. Her highlights include the beach club’s new gym (equipped with a cross trainer and other multi-purpose machinery), a Jacuzzi, a steam room and sauna. These amnesties are surpassed only by the extensive aft deck pool, from which guests can enjoy unobstructed views of the aquamarine waters and stunning islands. With its plentiful marine life and tranquil, secluded bays, the Seychelles makes for the perfect superyacht retreat away from the crowds – ideal for fishing, water sports or just some peace and quiet. The generously sized Icon provides the ultimate comfort and luxury for those wishing to discover the remote and exotic beauty of the Seychelles. Icon is managed for charter by Bluewater. Her weekly charter rate starts at €550,000. Australian-flagged Spirit is currently available for charter in the Great Barrier Reef and the Whitsundays. She is under the guidance of captain and chef team Marin and Jo Debanks. They both have more than 25 years’ experience in the yachting industry and know some of the best secret spots to visit in the South Pacific. Spirit's luxury wavepiercer design not only offers comfort while underway but also makes the 35 metre yacht feel surprisingly spacious. “She is small enough to get into any of the anchorages,” explains Captain Debanks. “Because she is under 35 metres we don’t have to pay for pilots or have any restrictions on the Great Barrier Reef. Her wavepiercer design also means she has the same volume as you would find on a 60 metre yacht, she’s huge.” Sprit has accommodation for up to 12 guests in five cabins, including a master cabin with a personal balcony aft. Other highlights of this tri-deck yacht include an expansive bar area on the top deck and a large outdoor area, with a spa pool, on her main deck. Her transom can also be lowered to either act as a swim platform during the day or an additional space for alfresco dining area under the stars. Spirit is managed for charter by Camper and Nicholsons and has a weekly charter rate starting from $90,000 per week. Australian-flagged Spirit is currently available for charter in the Great Barrier Reef and the Whitsundays. She is under the guidance of captain and chef team Marin and Jo Debanks. They both have more than 25 years’ experience in the yachting industry and know some of the best secret spots to visit in the South Pacific. Sprit has accommodation for up to 12 guests in five cabins, including a master cabin with a personal balcony aft. Other highlights of this tri-deck yacht include an expansive bar area on the top deck and a large outdoor area, with a spa pool, on her main deck. Her transom can also be lowered to either act as a swim platform during the day or an additional space for alfresco dining area under the stars. Spirit is managed for charter by Camper and Nicholsons and has a weekly charter rate starting from $90,000 per week. She may not be a traditional superyacht but 62.4 metre Aqua Mekong is offering charterers the rare opportunity to discover Asia’s Mekong River between Vietnam and Cambodia. The only luxury vessel for charter in the region her 20 suites can accommodate up to 40 guests. A five-star floating hotel she has a one-to-one guest to crew ratio in order to deliver superyacht-style service. Some of the vessel’s other stand out features include a private indoor and outdoor cinema, an infinity pool, gym and spa with two treatment rooms. Every suite has floor to ceiling windows for panoramic views of the river and feature either an outside balcony or interior day bed. To make the most of exploring these culturally rich cruising grounds Aqua Mekong is equipped with a private fleet of four speed boats, ten bikes and ten double kayaks. Daily excursions with an experienced guide are included and the crew has four English-speaking local guides. Aqua Mekong is managed for charter by Camper and Nicholsons. 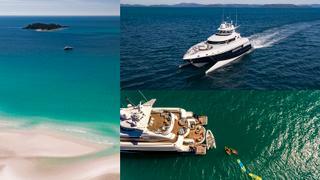 Her weekly charter rate starts from $194,600 for up to 32 guests. She may not be a traditional superyacht but 62.4 metre Aqua Mekong is offering charterers the rare opportunity to discover Asia’s Mekong River between Vietnam and Cambodia. 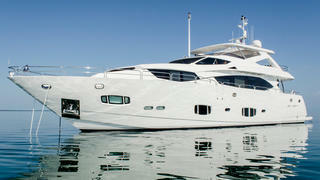 The only luxury vessel for charter in the region her 20 suites can accommodate up to 40 guests. A five-star floating hotel she has a one-to-one guest to crew ratio in order to deliver superyacht-style service. Some of the vessel’s other stand out features include a private indoor and outdoor cinema, an infinity pool, gym and spa with two treatment rooms. Every suite has floor to ceiling windows for panoramic views of the river and feature either an outside balcony or interior day bed. To make the most of exploring these culturally rich cruising grounds Aqua Mekong is equipped with a private fleet of four speed boats, ten bikes and ten double kayaks. Daily excursions with an experienced guide are included and the crew has four English-speaking local guides. Aqua Mekong is managed for charter by Camper and Nicholsons. 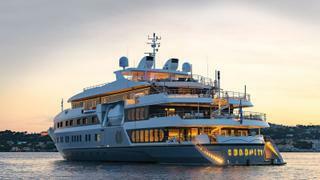 Her weekly charter rate starts from $194,600 for up to 32 guests. Opt for a spot of globetrotting on your next superyacht adventure with 44.2 metre catamaran Hemisphere. As part of her world tour she is currently available for winter charters in the South Pacific. Boasting an exceedingly modern and homey interior, she can sleep up to 12 guests in five cabins and has accommodation for ten members of crew. Her expansive main saloon provides a myriad of seating spaces, including an elegant cocktail bar and a raised lounge. A second saloon has cosy U-shaped seating and a large television, perfect for quieter nights in. She was delivered by Pendennis in 2011. Out on the main deck, guests can enjoy an al fresco supper or cocktails in the lounge area before relaxing on the trampoline forward. Alternatively, the sundeck features a Jacuzzi sided by sunpads and an additional dining table, all shaded by an optional Bimini. Hemisphere is managed for charter by Burgess and has a weekly winter charter rate starting from $260,000 in the low season and $280,000 in the high season. Opt for a spot of globetrotting on your next superyacht adventure with 44.2 metre catamaran Hemisphere. 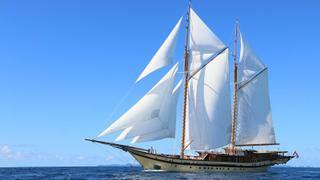 As part of her world tour she is currently available for winter charters in the South Pacific. Boasting an exceedingly modern and homey interior, she can sleep up to 12 guests in five cabins and has accommodation for ten members of crew. Her expansive main saloon provides a myriad of seating spaces, including an elegant cocktail bar and a raised lounge. A second saloon has cosy U-shaped seating and a large television, perfect for quieter nights in. She was delivered by Pendennis in 2011. Out on the main deck, guests can enjoy an al fresco supper or cocktails in the lounge area before relaxing on the trampoline forward. Alternatively, the sundeck features a Jacuzzi sided by sunpads and an additional dining table, all shaded by an optional Bimini. Hemisphere is managed for charter by Burgess and has a weekly winter charter rate starting from $260,000 in the low season and $280,000 in the high season. Step off the beaten track with 39.6 metre Serengeti, which will be available to charter in Mexico this winter. Ten guests can be accommodated in five elegant cabins, which includes a main deck master cabin. A crew of seven will be ensuring your trip to the wilderness runs smoothly, whether you're whale watching in Alaska or adventuring in Mexico. Serengeti was delivered in 2002 by Westport and refitted in 2014, with new carpets, HD TV in the skylounge and deck cushions. Guests can relax between excursions in the open plan main saloon, which boasts a comfy sofa and armchairs adjacent to a sleek dining area. Her skylounge is the perfect spot for sunset cocktails, as it boasts panoramic views through enormous windows. It also has two sofas, a small breakfast table, a wet bar and vast television. On deck, she boasts a dining area for 10 alongside a seated drinks bar and comfortable sofas. A lounge area is situated on the upper deck next to a D-shaped Jacuzzi, while on the sundeck there's an additional wet bar and sunpads for soaking up the rays. Serengeti is managed for charter by Northrop & Johnson, she has a weekly charter rate starting from $120,000. Step off the beaten track with 39.6 metre Serengeti, which will be available to charter in Mexico this winter. Ten guests can be accommodated in five elegant cabins, which includes a main deck master cabin. A crew of seven will be ensuring your trip to the wilderness runs smoothly, whether you're whale watching in Alaska or adventuring in Mexico. Serengeti was delivered in 2002 by Westport and refitted in 2014, with new carpets, HD TV in the skylounge and deck cushions. Guests can relax between excursions in the open plan main saloon, which boasts a comfy sofa and armchairs adjacent to a sleek dining area. Her skylounge is the perfect spot for sunset cocktails, as it boasts panoramic views through enormous windows. It also has two sofas, a small breakfast table, a wet bar and vast television. On deck, she boasts a dining area for 10 alongside a seated drinks bar and comfortable sofas. A lounge area is situated on the upper deck next to a D-shaped Jacuzzi, while on the sundeck there's an additional wet bar and sunpads for soaking up the rays. 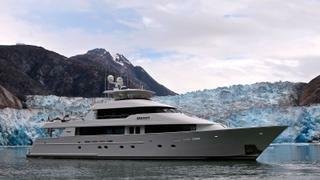 Serengeti is managed for charter by Northrop & Johnson, she has a weekly charter rate starting from $120,000. Trade the Caribbean in for the extraordinary coastlines of South East Asia this season on board 65.2 metre Lamima, with the added bonus of an onboard tour guide. The custom-built sailing yacht was delivered in 2014 featuring interior and exterior design by Marcelo Penna. Up to 14 guests can be accommodated in seven elegant cabins, each of which boasts decor that creates an intimate atmosphere via a neutral colour palette and soft woods with mid-century inspired details. Her spacious open plan main saloon has a drinks bar, seating area and dining table, making this the perfect spot for a laid back supper with friends. Her vast deck space boasts two al fresco dining tables, a massage bed, numerous sunpads and loungers, as well as multiple shaded relaxation areas. Managed for charter by Camper & Nicholsons, Lamima has a weekly charter rate starting from $126,000. Trade the Caribbean in for the extraordinary coastlines of South East Asia this season on board 65.2 metre Lamima, with the added bonus of an onboard tour guide. The custom-built sailing yacht was delivered in 2014 featuring interior and exterior design by Marcelo Penna. Up to 14 guests can be accommodated in seven elegant cabins, each of which boasts decor that creates an intimate atmosphere via a neutral colour palette and soft woods with mid-century inspired details. Her spacious open plan main saloon has a drinks bar, seating area and dining table, making this the perfect spot for a laid back supper with friends. Her vast deck space boasts two al fresco dining tables, a massage bed, numerous sunpads and loungers, as well as multiple shaded relaxation areas. Managed for charter by Camper & Nicholsons, Lamima has a weekly charter rate starting from $126,000. Discover Fiji, French Polynesia, Indian Ocean, New Caledonia, New Zealand, South-East Asia or the South Pacific on board 63.39 metre explorer yacht SuRi this season. Able to cater to the whim of every guest, SuRi boasts a huge array of water toys as well as a helicopter and sea plane, so you can discover new landscapes from both sea and sky. She boasts a large Jacuzzi beneath optional bimini shades on her sundeck, as well as a bar, sunpads, al fresco dining and a cosy lounge area. A vast helipad area take pride of place aft on the upper deck, with a viewing bench and table forward, while the main deck aft has a large swimming platform. Below deck she provides guests with a fully equipped gym, a steam bath and massage room and a saloon on the main deck that has glass floor panels for underwater viewing. Additionally, there are two skylounges, one of which boasts three walls of large windows for extraordinary views of your surroundings and one which has a bar, dining area and sofa area, with a connecting study. Explorer yacht SuRi was delivered in 1978 by Halter Marine and underwent an extensive refit in 2016. She can sleep up to 12 guests in seven elegant cabins, which includes a full beam master suite complete with private office and en suite. Managed for charter by Yachtzoo, SuRi has a weekly summer charter rate starting from $350,000. Discover Fiji, French Polynesia, Indian Ocean, New Caledonia, New Zealand, South-East Asia or the South Pacific on board 63.39 metre explorer yacht SuRi this season. Able to cater to the whim of every guest, SuRi boasts a huge array of water toys as well as a helicopter and sea plane, so you can discover new landscapes from both sea and sky. She boasts a large Jacuzzi beneath optional bimini shades on her sundeck, as well as a bar, sunpads, al fresco dining and a cosy lounge area. A vast helipad area take pride of place aft on the upper deck, with a viewing bench and table forward, while the main deck aft has a large swimming platform. Below deck she provides guests with a fully equipped gym, a steam bath and massage room and a saloon on the main deck that has glass floor panels for underwater viewing. Additionally, there are two skylounges, one of which boasts three walls of large windows for extraordinary views of your surroundings and one which has a bar, dining area and sofa area, with a connecting study. Explorer yacht SuRi was delivered in 1978 by Halter Marine and underwent an extensive refit in 2016. She can sleep up to 12 guests in seven elegant cabins, which includes a full beam master suite complete with private office and en suite. 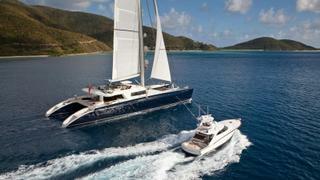 Managed for charter by Yachtzoo, SuRi has a weekly summer charter rate starting from $350,000.